Doug’s conversion is a modified Crown installation. The car is a 1966 Corsa which was last licensed in 1976 and parked until he acquired it in 2006. 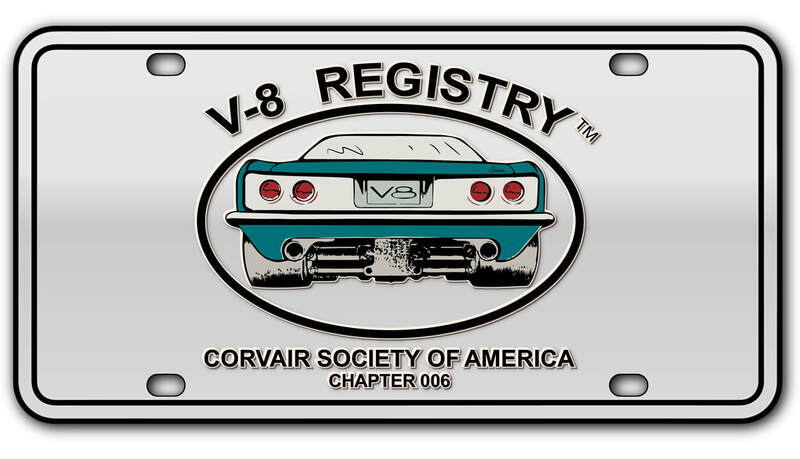 He had a 9 month plan to build a street V8 after many years of building Corvair racers. 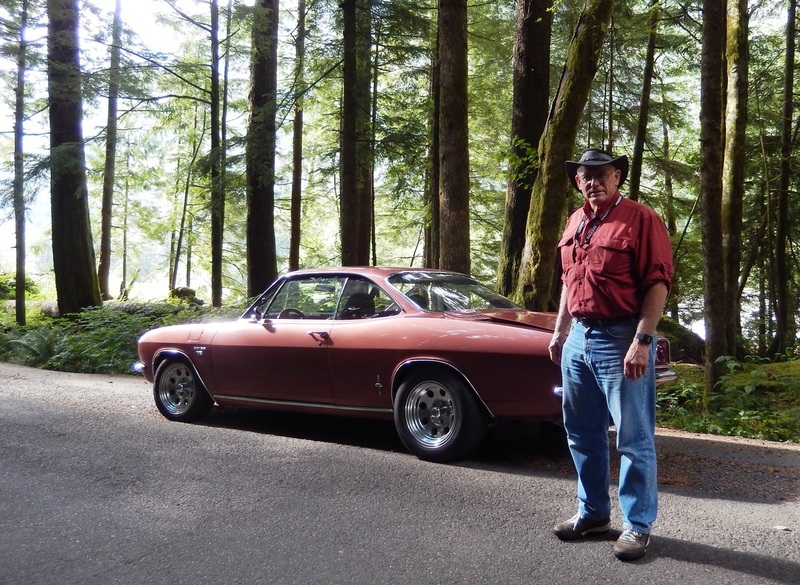 The ground up restoration surprised him as it took 2 years and he realized that building a race car would have been easier but he is quite pleased with the results of his metallic copper painted Corvair conversion. He thanks those who have shared their cars on line as he spent many hours viewing other conversions to come up with his final design. Design issues were to minimize interior engine noise, maximize driver’s legroom and to provide heating and air conditioning for passenger comfort. First on the tasks was how to reduce noise transfer from the engine to the car body. Consequently, the entire engine/drive train was insulated from the body by rubber mounts. Second was to design a good sound and temperature insulating engine cover. The cover design uses .062” aluminum as the skin on a 1” square aluminum frame that is hinged like a clam shell where both the front and one half of the top open by releasing two clips which provide both an airtight seal and easy access to the engine. The hinged panels can be totally removed is several minutes. The internal side of the cover is both sound and heat insulating by using ¼” fiberglass on aluminum foil. The aluminum foil is a major factor in reduction of radiant heat into the cover (tested). The exterior of the cover has 1/8” + 3/8” commercial sound deadening material with a layer of jute and carpet which provides excellent sound isolation. Dual fans are installed with automatic and manual controls to remove engine compartment heat. Passenger compartment engine noise and heat has been virtually eliminated. Passenger heating and cooling was accomplished using the stock heater controls and air duct. 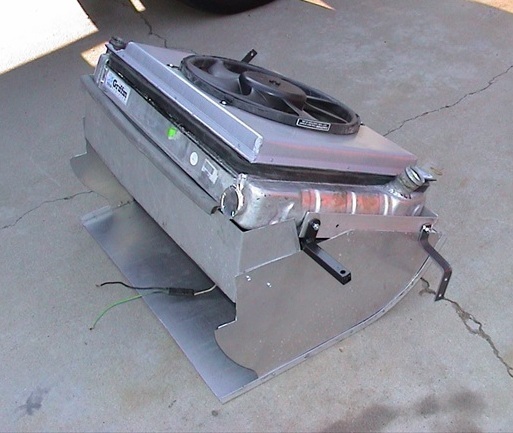 A custom designed and fabricated heating and cooling unit mounted on the right side of the engine, coupled to a modified stock heater air duct was the answer. An AC on/off switch was installed completing the installation. To increase legroom a remote water pump was used similar to what is used with Porsche 914 V8 conversions, leaving the front of the engine cover flat. This moved the forward engine cover panel rearward giving an additional 5 to 6 inches of legroom over the original Crown conversion. The Crown sub-frame needed to be replaced. A custom, under the engine bolt in sub frame was fabricated. It is bolted to the inside of the rocker panels and to the transmission horse collar. This design included allowance for clearance of the low slung full-length headers. Plates with captive nuts where installed inside each rocker panel which removed the need of welding in the sub frame. accomplished by raising the front of the deck lid (flow meter testing) about 2 inches. Installing full size Chevy front disc brakes with a vacuum boosted master cylinder and proportional valve from a Chevy Astro van increased stopping power. 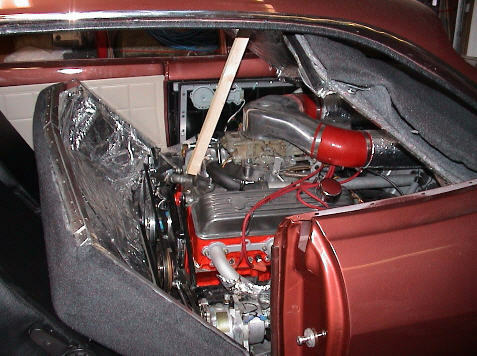 The rear quarter glass is motorized by coupling window drive motors from a Camaro to the window crankshafts with a custom built coupler. The crankshaft is drilled and the coupler is connected to the shaft with a pin. The coupler mates with the gear on the window drive motor - simple and effective. The front tires are 205x50 on 15x7” rims with 225x60 on 15x8” rims for the rear. Rear end ratio is 3.08:1 with limited slip and a 4-spider carrier. The top is enforced with a ¼” steel plate cover. The engine is a 327ci, that has been balanced, with 9.5 : 1 compression ratio and a mild cam (5700 rpm). Cylinder heads are CC’d, with port matching and stainless steel roller rockers. The full length headers with turbo mufflers, low rise single plane aluminum intake manifold let the engine breath. The engine is finished off with an aluminum oil pan and valve covers, HEI ignition system and a 600 cfm Edelbrock carburetor and an electric fuel pump with safety run control. August, 2014 - The new radiator from a Ford diesel van has worked. I can now run with traffic at 75+mph in 100 degree temperature. Testing was performed on the driver from California to Tacoma, WA for the CORSA national convention averaging 18 MPG for the 2000+ mile trip. While the new radiator was not needed in Washington State, it was needed on the California and Oregon freeways. This picture was taken at Mount Rainier National Park.